For other uses, see White coat and Gown (disambiguation). A cleanroom suit, clean room suit, or bunny suit, is an overall garment worn in a cleanroom, an environment with a controlled level of contamination. One common type is an all-in-one coverall worn by semiconductor and nanotechnology line production workers, technicians, and process / equipment engineers, as well as people in similar roles creating sterile products for the medical device industry. The suit covers the wearer to prevent skin and hair being shed into a clean room environment. The suit may be in one piece or consist of several separate garments worn tightly together. The suit incorporates both boots and hood. It must also incorporate a properly fitted bouffant cap or mob cap. 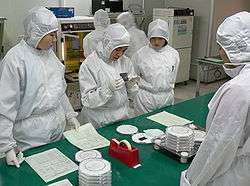 More advanced designs with face covers were introduced in the 1990s (like the Intel fab worker-style suits seen on the Pentium product advertisements). Suits are usually deposited in a store after being contaminated for dry cleaning, autoclaving and/or repair. Similar suits are worn in the containment areas of nuclear power plants. These suits consist of the main garment, hood, thin cotton gloves, rubber gloves, plastic bags over normal work shoes, and rubber booties. The wrists and ankles are taped down with masking tape. Occasionally a plastic raincoat is also worn. Removal of the garments (into several barrels) is a complicated process which must be performed in an exact sequence. Often a health physicist is present in the work area to observe good anti-contamination practices. ↑ James D. Plummer; Michael D. Deal; Peter B. Griffin (24 July 2000). Silicon VLSI technology: fundamentals, practice and modeling. Prentice Hall. p. 158. ISBN 978-0-13-085037-9. Retrieved 24 February 2012.